The threat of nuclear weapons maintains world peace but nuclear power provides cheap and clean energy. 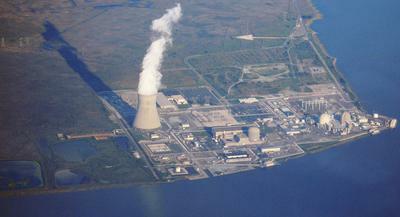 The benefits of nuclear technology far outweigh the disadvantages. Advances in nuclear processing have gave us a low cost energy source, but at the same time nuclear power can be used against human being. There are several advantages of exploiting nuclear energy, for example, very low CO2 footprint, high energy capacity and low costs to consumer compared to other energy sources. On the other hand, nuclear power has serious drawbacks, for instance, threats of nuclear war, disastrous power plant failures and lack of proper radioactive waste degradation technology. First of all, nuclear energy is one of the cleanest in terms of carbon dioxide production, and for decades it has been outcompeted conventional fossil fuel energy which is directly responsible for greenhouse effect nowadays. In addition, nuclear raw material contains far more Joules per kilogram of fuel than energy sources like hydrogen, shale gas or petroleum. Furthermore, previously mentioned aspects make nuclear energy as one of the cheapest options for nation’s energy politics due to the fact that raw materials are widely abundant and accessible. Secondly, in recent decade society is highly concerned about major drawbacks of nuclear power, especially growth of nuclear stocks in Middle East, as they can be used for nuclear weapon production and could ignite nuclear war. Another disadvantage is raising amount of nuclear waste that comes from nuclear power plants. Due to the fact that it is very expensive and in some cases even impossible to degrade radioactive waste, most of the countries have decided just to collect and store it for unknown period of time in underground warehouses. Although several scientific groups are pursuing a sustainable disposal technology for decades, there has not been a significant progress. In my opinion, probably the biggest threat for the society is nuclear power plant failures that could lead to disastrous consequences both to environment and human being. To conclude, I disagree that the benefits of nuclear technology far outweigh the disadvantages. I think, significant advances in nuclear processing technology are needed to safely exploit nuclear energy. Please provide me with feedback on my Nuclear Power Essay. Thanks. I have reviewed your essay, and I have some comments about the organization. First, you wrote many examples in the introduction which made it very long intro. Second, do not include your opinion in the body paragraph as you did at third paragraph. How can I have my writing check here? the innovation of unclear technology has brought human being into a new world. some people believe its advantages over the disadvantages. however, i have different view on it. doubtlessly, the advances of nuclear technology benefit people in many ways. the invention of nuclear generator provides thousand times electricity than the traditional one does. also, instead of burning fossil fuel, it emits no carbon dioxide to the surroundings, which is recognised as the only solution to solve global warming and continuously supplies adequate power. besides, nuclear weapons are powerful defences to against terrorist activities. although the nuclear energy generation can eases the energy crisis all over the world, it is highly hazardous not only to nearby citizens but also nations. last year, the tsunami destroyed nuclear plant in Japan and caused massive reactant leakage. this accident contaminated nearby water region, even countries over the pacific ocean are affected. countless kinds of species are mutated, which the harmful consequences are still unknown. the incident poses serious threat to all organisms. furthermore, countries are competing to hold as much nuclear weapons as possible. they claim that such weapons are simply for security purpose. however, the total amount of nuclear weapons is more than enough to destroy the entire world several times. in my opinion, it is questionable that maintaining national peace by such scary weapons. on a whole, nuclear technology is beneficial to mankind especially on energy issue. meanwhile, it also poses life-threatening hazards to all species. i doubt about the worthiness of risking people's lives to obtain temporary merits. When starting a paragraph start with a capital letter and not small, for instance you started "the innovation" instead of "The innovation" "doubtless" instead of "Doubtless".